It's been a bit, O Best Beloved. Here's an update of sorts. My case of Asian Airline Flu seems to be improving, leaving me with a lingering cough and not much else. I am sitting now in the basement of the new house. About 95% of our stuff is here, thanks to a 26' Penske truck and some burly men. They arrived around 0930 on Saturday morning and began to play Tetris with our belongings. By 1430 the truck was full. J and a handful of residents met me at the house at 1600. Angel got there around 1700, due to truck driving slower than tiny car. In an hour and a half, it had vomited its contents all over the house and half an hour later was gone back to the depot. One paragraph. It was a lot more than that, when we were doing it; they were trying to move the piano, all 800 pounds of it, and stack our giant couch - so oddly shaped that they wound up putting it on its back and stuffing it with bags and a rocking chair - they were nice enough, but the third man didn't show up and that made things slower. Monday's crew got the TV and couch down to the basement so that they could watch Star Wars. S and J explored the house with me; we are determined that there must be a hot tub on the deck in back. The residents have dubbed the corner of our basement that contains the computers NORAD. There are only three of them down here at the moment, I don't see what the big deal is. Monday's crew also got the camper fridge out of the corner, and replaced it with the small black dorm fridge - mostly thanks to broken_onewon1, who had the shelving disassembled before I blinked an eye. We played Risk with the Lord of the Rings gameboard, drank soda, had hamburgers, and gave house tours. People toted boxes around for me. It was nice. I really wish my cell phone worked in this house though. We put couches and table and sideboard and lamps together in the front room; it looks like a room and it's been made quite comfortably usable for gathering in - unlike the previous front room in the old house. I have cleaned some of the kitchen cabinets and put things in them. I can't find my cookbook box, and that's irritating. There are several dozen boxes of kitchen things remaining, it seems. I have unpacked two bags of cans into the downstairs pantry; I may see about shelving it in properly - at the moment, there are just a few boards propped up along the edges to keep cans from falling down the cracks. We will definitely need a dehumidifier down here; it makes me wheeze at times. Mental note: get peak flows done for asthma; I should probably be on a steroid inhaler. I need a stepladder to clean kitchen shelves with, and if we're going to use the top shelf of my improvised pantry for anything other than large paper goods (I vote large paper goods!) then I'll need one to get there too. And now I am simply exhausted by the idea of unpacking all the things I packed up, but I know it must be done. I want to make my Angel stay home from work with me and work on it, but I know that oughtn't to happen. And to boot, I must find and complete my PALS and ACLS manuals, re-gather all of my residency stuff, call the AAFP and let them know I'm no longer a student, register for the Kansas City conference and fax my housing form in as soon as possible because it was due today. Not to mention that I'm sure I'm slacking on the STFM information I needed to pass on to Alec - and I still haven't told you any more about Japan. It rained in Hiroshima. 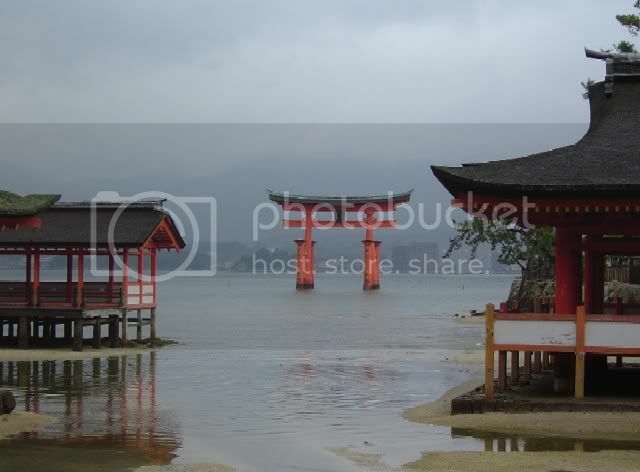 It rained the day we wanted to set out to Miyajima island to see the mystical Otorii in the sea. We went anyway. It was grey and misty and magical in the sort of way that the memory of rain can be, when one is on the seashore looking across to see the land. It was an ocean that seemed like a lake but for the salt spray across my lips as the ferry took us from hither to yon, cutting a path of white froth through the grey steel waters beneath us, warm and damp and enfolding. Itsukushima shrine played peekaboo with us - a half-in tide glassed beneath the front of the buildings, revealing the stilts like the underpinnings of a corset, ungainly when shown, the foundations of eloquence. They call them vermilion-lacquered, and perhaps some of them are, but the colour was rather more orange than I had thought vermilion to be. The orange shrines of Japan. You pay to enter the shrines, to walk not in sacred rooms but through the history of the place. In many places, you pay to enter the shrines and the temples and then you take your shoes off to pad sock-footed or slippered across the boards. When going to Japan, O Best Beloved, bring socks without holes and shoes that slip easily off and on. The Japanese do; I saw girls on the buses wearing loafers with the heels folded under from coming on and off so often. We paid to walk out over mud flats that melded beneath our feet to smooth and lapping molten steel, gaze at the hazy mainland, ponder the meaning of the Otorii, which stands on the seafloor and is held upright only by its own weight. 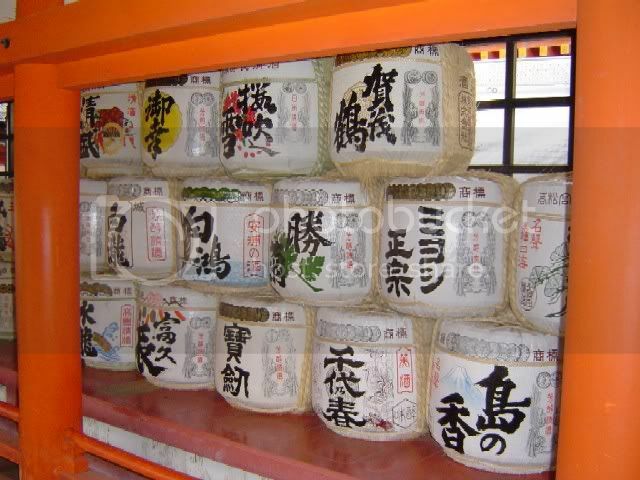 We paid to glimpse the shrine's gilded decorations, the piles of sake barrels, the spiritual treasures that lie within. We found a monk to sign my book of stamps - 300 yen for a temple stamp and calligraphy that is not really writing but art - and it was beautiful. It was more than beautiful, O Best Beloved, but there is not a word to name it. The Otorii, looking out from the shrine. Sake, offered to the shrine. Life as a Shinto priest must be good. Hiroshima - more on this later. 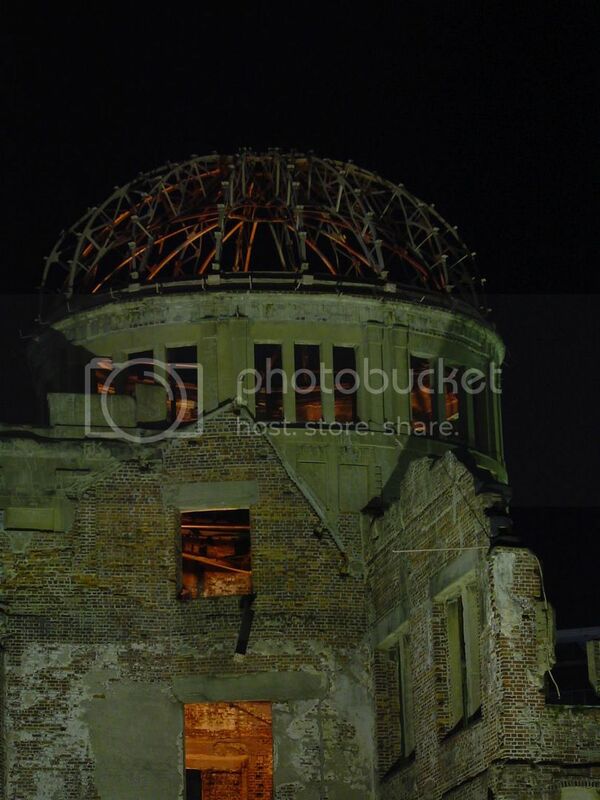 The atomic bomb dome at night. If you look closely, you can see the reinforcing beams. 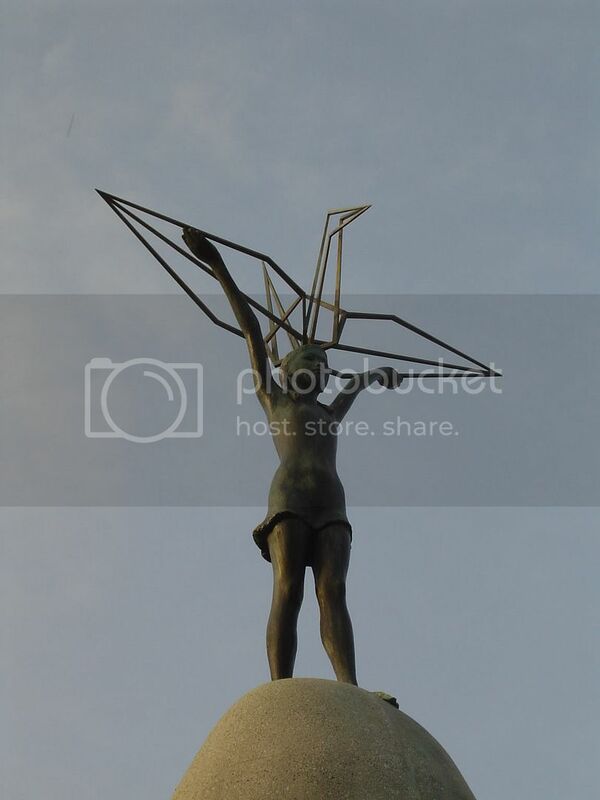 The figure of Sadako Sasaki holding a paper crane tops the Children's Peace Monument. 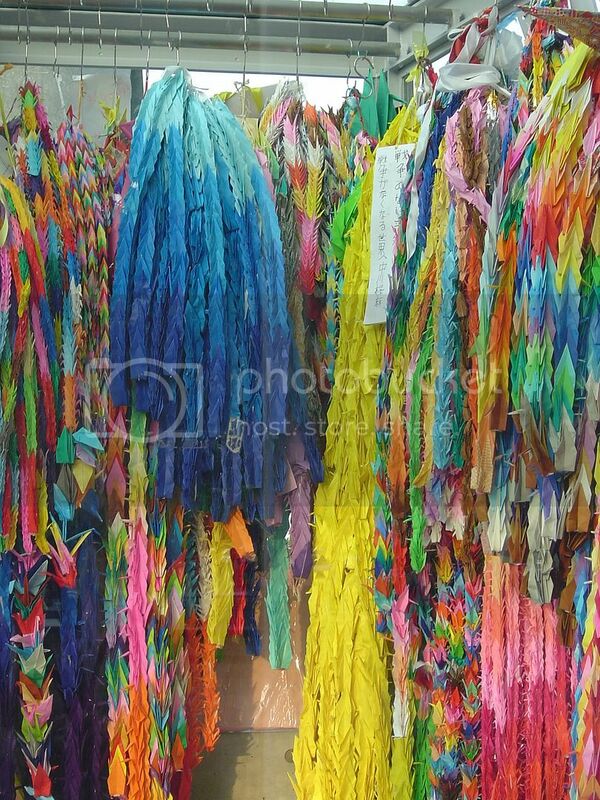 According to the Peace Museum in Hiroshima, she finished her 1,000 paper cranes. According to the most popular stories about her, she didn't. I don't know which is true. One of the crane boxes at the Children's Peace monument. And that's enough for now, O Best Beloved. More to follow, I hope. Thank you for sharing some of the photos. I've never been to Hiroshima before... I didn't even know there was a peace museum. It's a fantastic place. I'll have to tell more about it. What timeish Sunday? I'm still unsure of plans--and cellphoneless until Friday at least. Thanks for pictures! Will keep you posted. If you'd rather come to SB and help unload and see new house, that would be fine too. say the word, lady, and we'll be there. i work on saturday, and we're dancing in goshen saturday night, but we have no plans for sunday yet. i'd be more than willing to help you out, and i'm betting beo would be willing too. How's about you guys help unload in So Bend? Don't know times as of yet. i'd be more than willing. i'll mention it to Beo. 1) When I play tetris with my belongings I usually lose. 2) I'm glad I don't think that folding a thousand paper cranes could cure leukemia.